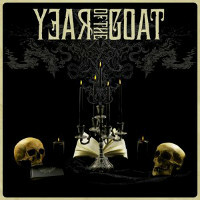 The band Year of the Goat was first presented to me as "black metal". When I first heard the name of the band, I thought: OK, true black metal of the darkest sort, now again? Then I thought: why an easy reference to Chinese horoscope? Curious. The fact is you might me completely disturbed when you put Lucem Ferre on. For traditional black metal I wouldn't say it is. The band themselves wishes to pinpoint that it was in the 60’s and 70’s that the true genius of dark art was born. Thus Year of the Goat take the counterpoint of all true old-school black metal goat worshipping bands. Lucem Ferre abolishes time and makes you see it for the illusion it is: sinister gospels with properly dark atmospheres can be created whenever and wherever. They link the 60's with the genres that came later on in a witty way. As I see it now I'd even say there's a bunch of irony in the name of the band. This piece of modern sounding 60's satanic rock is very welcome in my playlist, let it be more years of the goat!